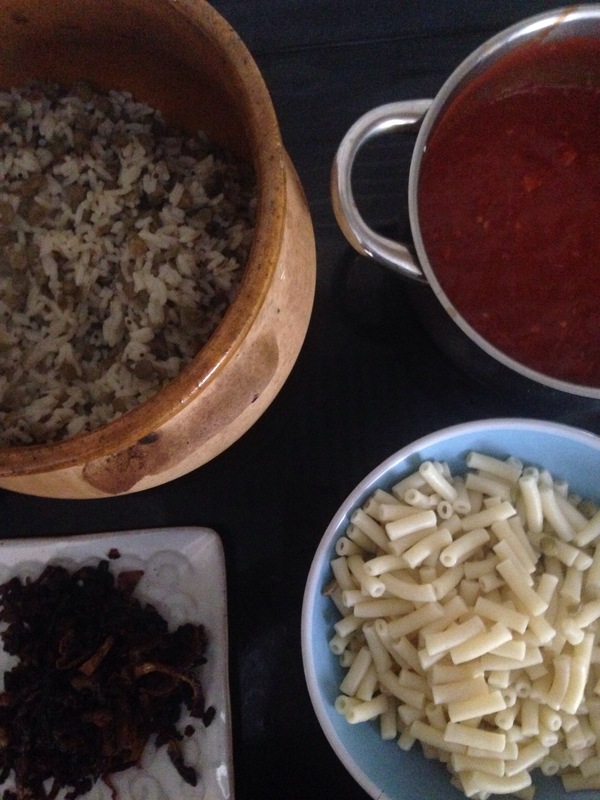 This soup was an accident, my little girl fancied soup for tea …. and why not? This soup as it says makes your soul go aaahhhh and all your troubles will sail away for those moments. It’s cheap to keep too…..
A very small bit of fresh ginger finely chopped. So I gently softened an onion in oil, with celery and leek until soft . Then add the yellow split peas with plenty of hot water, boil and then turn down and cover. When the yellow split peas start to soften add the stock. Keep checking if you need to add more water. Once the yellow split peas are soft mash any formed split peas into a liquid , or liquidise. 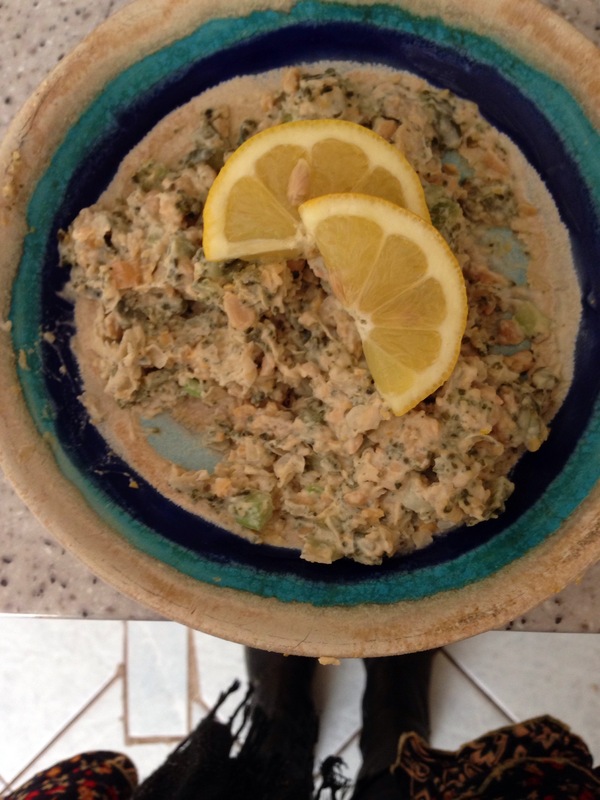 Then add seasoning to taste and add fresh parsley finely chopped …. I am a firm believer that being Vegan is about eating more and better, with a smugness that animals are not suffering because of me. I love a roast dinner and I love Yorkshire pudding, I particularly like these and prefer them to the version that contain egg. First put oil in your oven dish and put into a hot oven 220 degrees. Mix in 2 cups of your chosen Vegan milk, I love Cashew milk. Whisk into a smooth batter. Pour into your hot oven dish and don’t open the door for 20 mins. This recipe could be adapted to make vegan toads in the hole,! I heard a rumour that Celeriac can be treated like meat. Having successfully completed Veganuaryj with ease and feeling well and eating healthy food it seems like it’s knocked my need to eat cheese and milk and was never that keen on eggs. I had deluded myself that my children need Cows milk in their diet, and yesterday I cancelled my milk man. They can drink my favourite Cashew milk too! So here to the trials what can I do with Celeriac! I am slow roasting this in Harissa paste on a bed of Beetroot , Celery , Garlic, Carrot, Onion trying to sear it first. I plan to have Cold cuts for serving with a roast and fine deli slices. I love Vegan food, as a very long term Vegetarian I guess about 25 years of absolutely no meat , fish or poultry (proud face) I am on and off the Vegan road. I feel healthier and happier when on a Vegan mission and it’s getting tastier and easier. So obviously veganuary challenge was something I was ready for! I also have a male friend ❤️😂 coming around after work tomorrow and so I need something ready for us to eat (I won’t get home until late) so there needs to be something ready to go …. The photo is extra portions….. I have made a lovely big pie for tomorrow! Fresh Parsley finely chopped…. lots of it!!! Line a greased oven dish with rolled out pastry. Peel and shop the Potatoes into bite size pieces, boil until tender. Gently fry onion until soft. Once soft add finely chopped garlic, Vegan butter and milk warm this through. Add Parsley, Potatoes and cheese. Stir through then add the mixture to an oven proof dish with pastry case. I have made a very simple little snack! I had high hopes for this and it hasn’t disappointed me. At this time of year vegetable growers are proudly plucking the last of their crops, giving away gluts of this and that. Well if you have searched and found this look no further! This is a very cheap recipe if things are a bit tight, or you are a scrooge. 2 small or one large courgette or a fancy pants one if you so do wish, grate it finely and squeeze excess water off. And added chilli powder and a chillies finely chopped to half of the mix as my children are not chillie heads yet! I mushed up the butter beans with a fork and mixed in the rest of the ingredients. Made into little patties and coated in chick pea flour. If you have time put them in the fridge. Shallow fry the fritters for about five minutes. Turning each side. 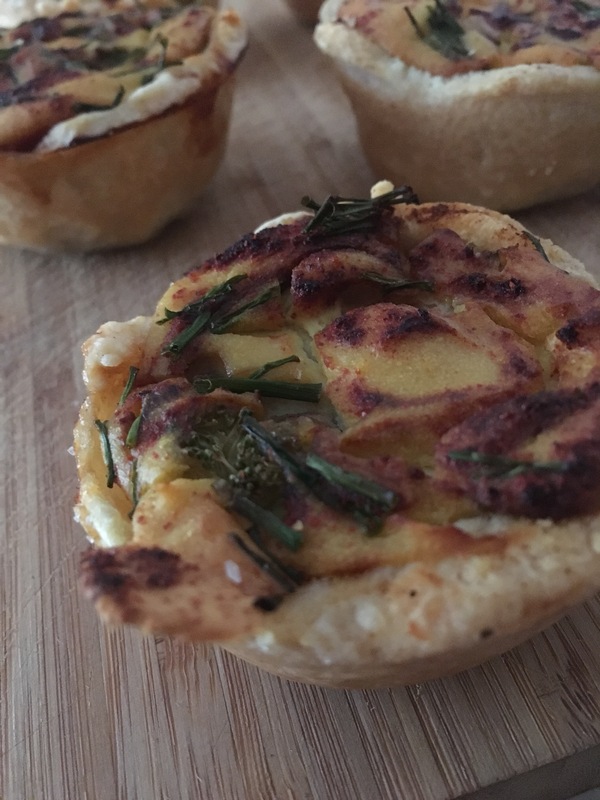 I made these Lovely little Vegan quiches today, rather than use a flan type dish I decided to use a muffin tin. The great thing about doing it this way is I have 6 delightful little tartlets with potentially 6 different flavoured combos! 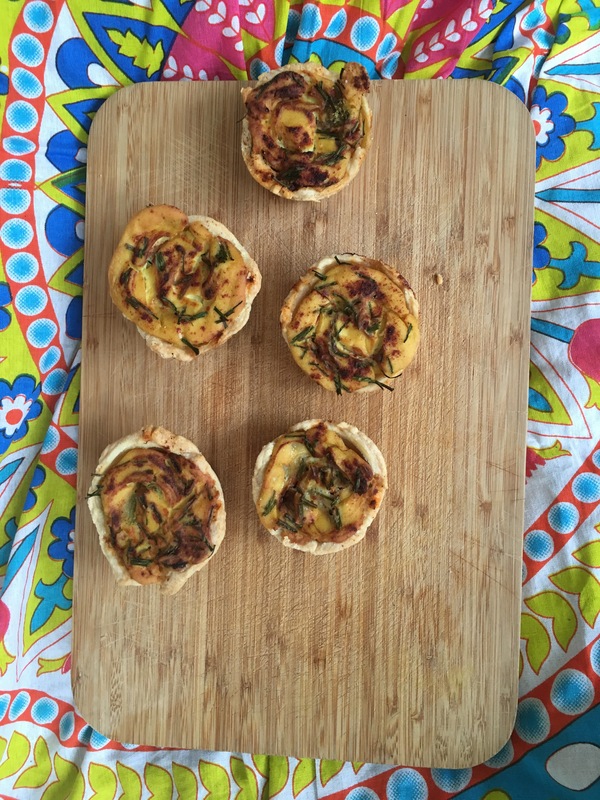 I used ready to roll shortcrust pastry, it really is no trouble to make these. I then mixed a block of firm silken tofu with a mixture of 2 tablespoons of chick pea four mixed with 100mls of water, also adding 1/2 a teaspoon of Tumeric for a yellow colour a similar consistency to pancake batter. I then whizzed it up in my mini blender and set aside. Grease the muffin tin with vegan spread, roll out pastry and cut into circles to fit into the muffin tin. 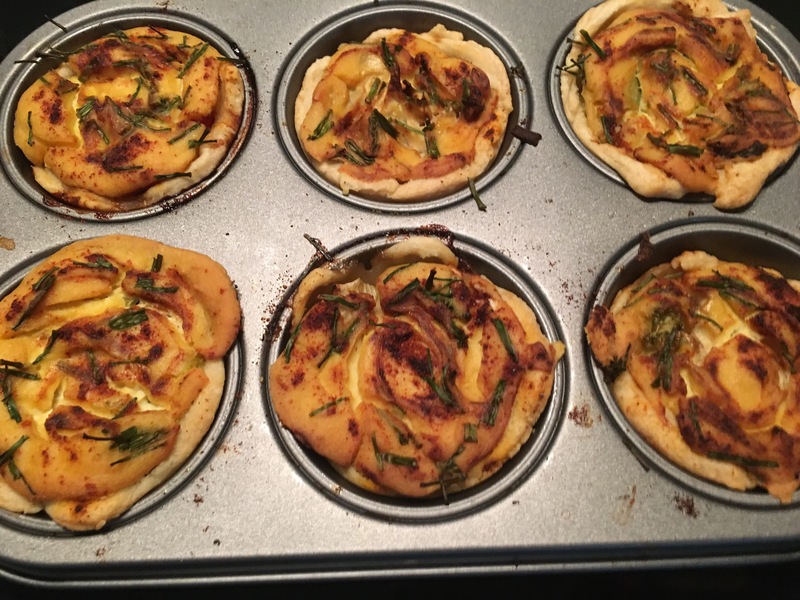 Add in the vegetables that you fancy, in each pastry cup. I used, mushroom onion and tomato in some. Broccoli and spring onion in another. I would have used sundried tomato if I could open the jar 🙄. 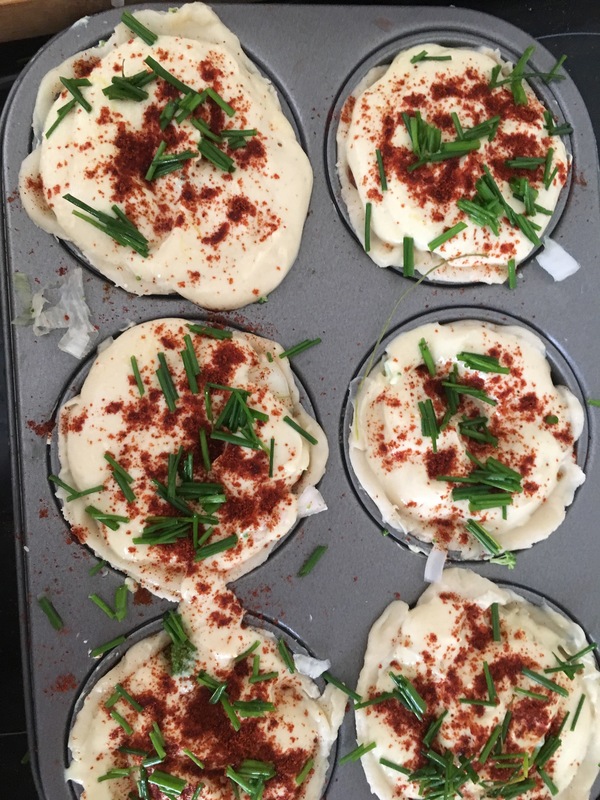 I added plenty of the tofu mixture to each tartlet and then sprinkled smoked paprika on top, and some chives. I then baked for 40 mins…your home will smell divine! Let them cool, and serve the little devils up with some green leaves, chutney or a pickle or four these would fool anyone! Well this is a new little recipe I am making tonight! Going to blog on the go!!! 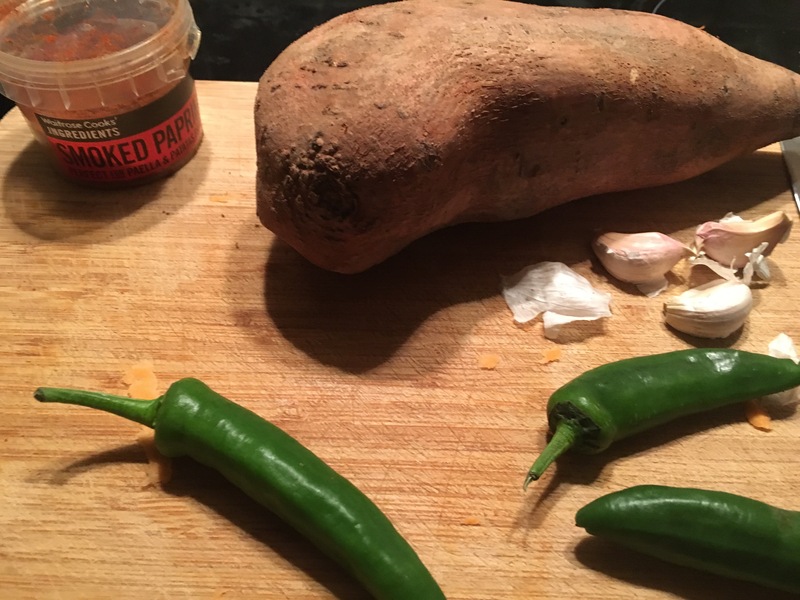 I basically have no idea what I am cooking, I have put some baked sweet potato wedges in the oven with olive oil, I am planning to add garlic and sliced green chillies and smoked paprika at some point! 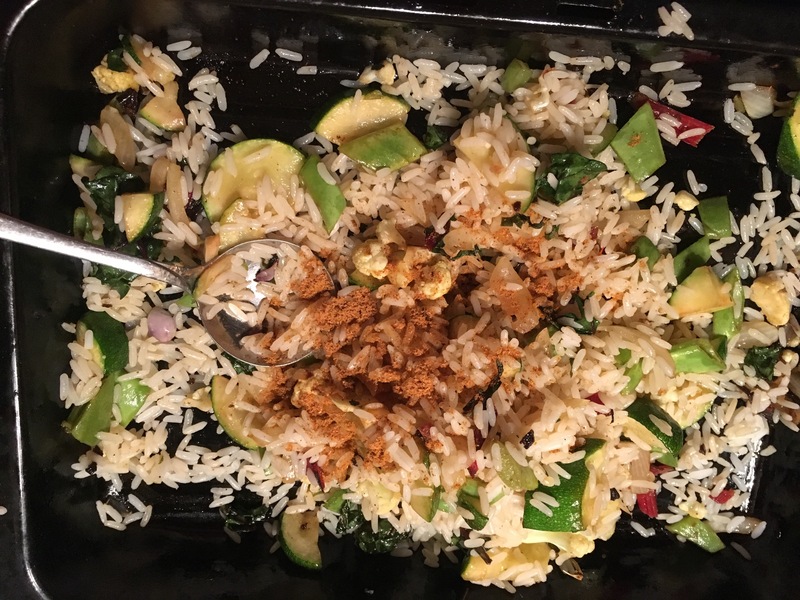 I also have some cooked white rice that I will add to the oily leftover pan at a point, got some cauliflower, coriander…. I also have wine to drink so this could get silly! Ha ha my sweet potatoes smell lush and want them to crisp up! Mix it all in, add the sweet potato wedges, mix them through, return to the oven and then serve up a huge portion of this, as it’s crazy amazing! 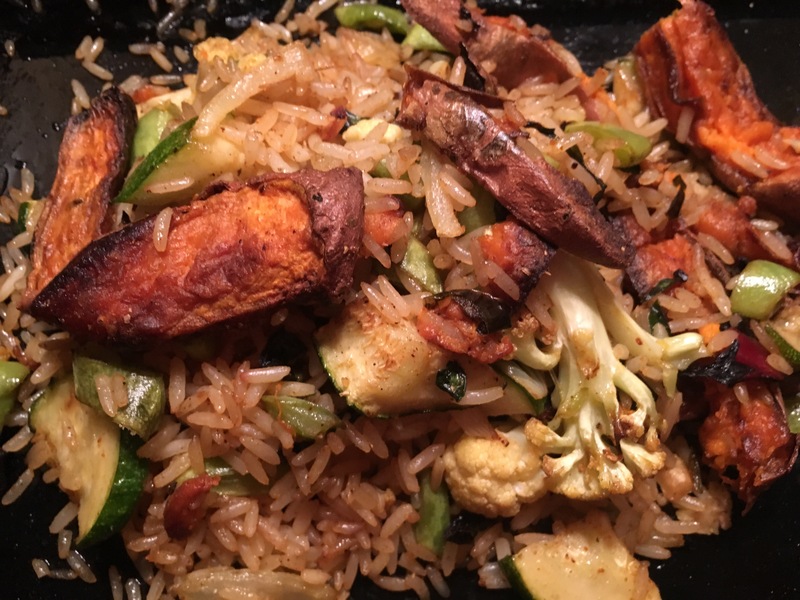 The sweet potato has a meaty type texture, the crunchy skins with chewy bits and then soft flesh, mixed through with different textures of vegetables and a braised tasty rice, comforting Vegan heaven! I even thought a sprinkle of pumpkin and or sunflower seeds would be lovely, serve with Green salad if you fancy, or big slices of Beef tomato. To me it’s like a new Invention of taste, possibly a little bit like curry there are similiar but different versions . All scrummy but this to me can’t be rushed……. If you are not familiar with it it sounds rather strange! 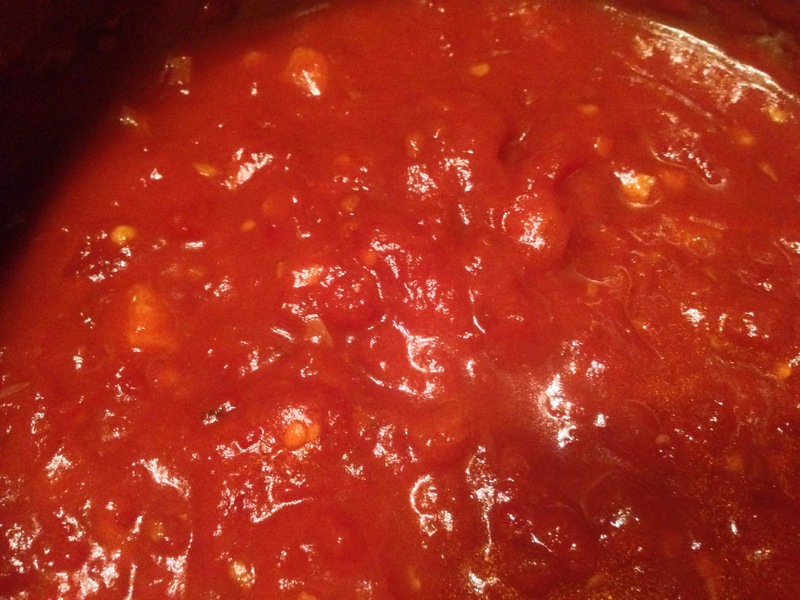 To me it has become intriguing what’s not to like about a spiced tomato sauce,. 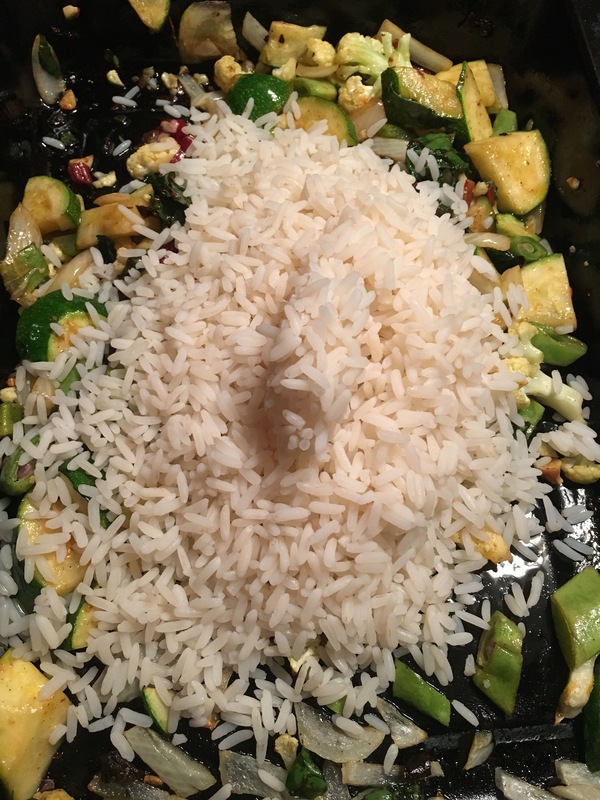 Underneath is rice with surprises including mustard seeds , cumin,other spices Green lentils. 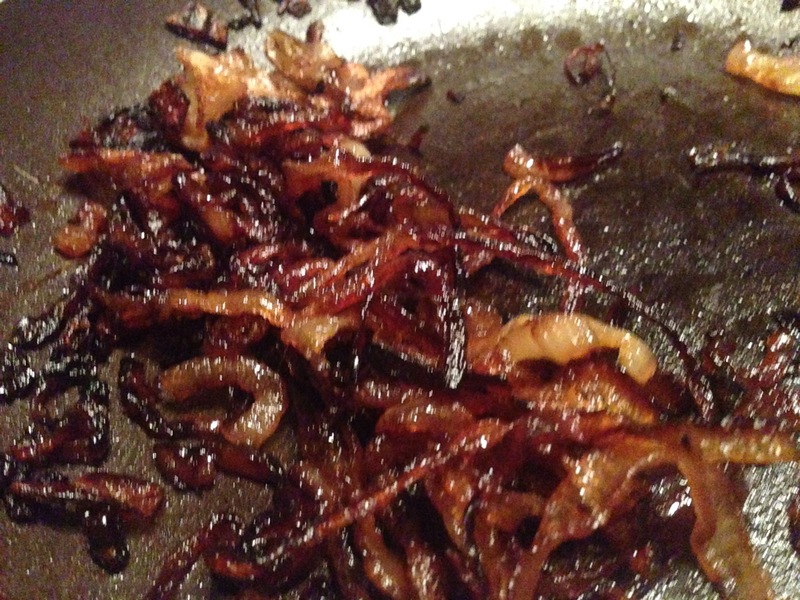 On top are Onions that have been loved and adored for an hour as they become crispy. Oh and then the addition of Macaroni!!!! I am inventing a hashtag for my love of a happy Friday moment! These fritters are gorgeous! whats even better is they are simple and quick to make and there are endless posibillitys of flavours! These happen to be Vegan/ vegetarian. 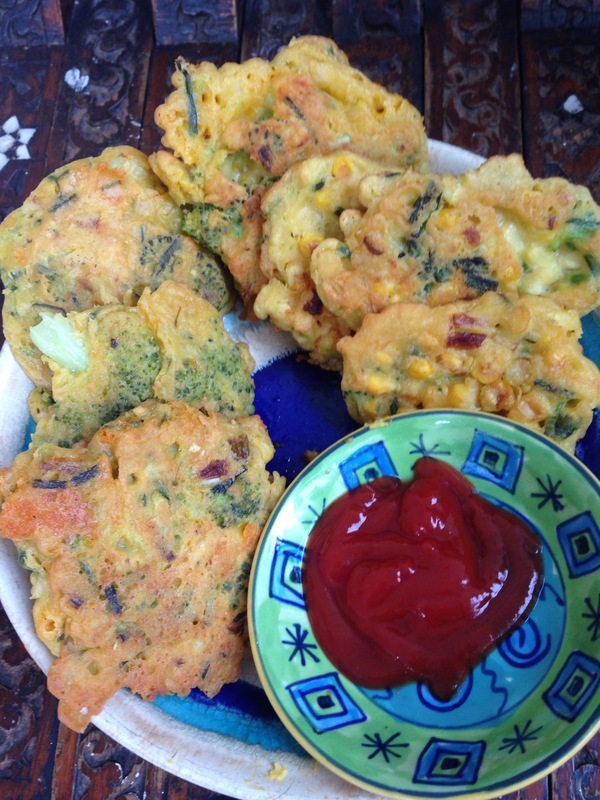 They are made with gram flour batter made with 50g of flour mixed with 100mls pf water. I used cooked broccoli and red leiceter cheese for one flavour, and sweetcorn for the other and both had spring onion and chive. gently fried on a medium heat for 10 mins and my little boy enjoyed them with a dollop of ketchup! these are going to be great for campervan cooking! tin of sweetcorn to had and a bag of flour! really chuffed with these 🙂 sneaky way to get healthy veg and chickpea goodness into my boy! being a bit of a spice monster i willl be making a chilli head one of some discription! Well, well, well I thought this was going a bit far and the outcome would be rubbish! 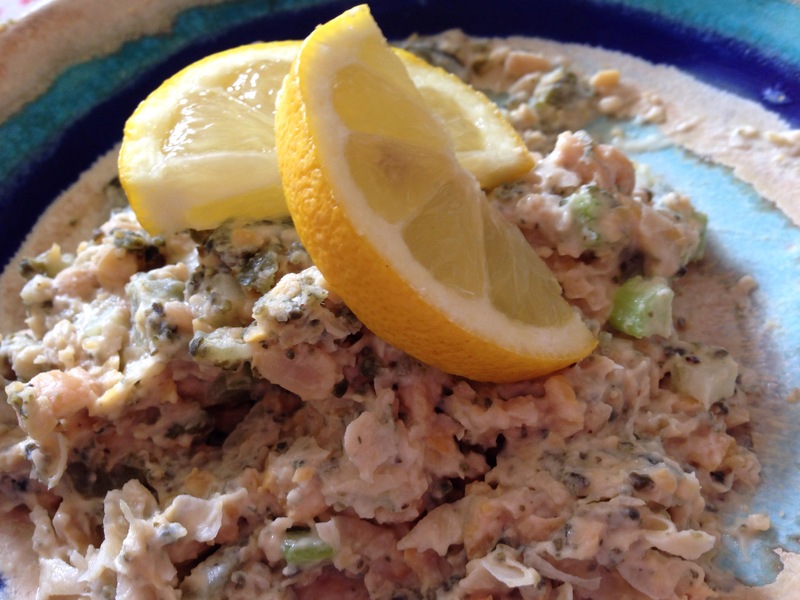 Not at all, a lovely fresh flavour and great texture and utterly healthy! Really quick and cheap to make! My meat eating wonderspouse polished it off! Mix all of the above leave for an hour or better overnight. Make a yummy sandwich or on top of a baked potato. Once upon a time I became a single mum. I left my job in music & started writing. A journey in the life of Queen Bee where NO MALE is crowned King. Losing my sanity to being a single mother and loving every minute! Newly found single parenting in a crazy world, keeping my sanity in amongst it all and finding myself again.